Gothenburg, (August 20, 2018) - Atomize, an upcoming Swedish based revenue management system (RMS) provider for hotels, today announced one of the biggest and most luxurious hotels in Europe, Gothia Towers, as a client. Gothia Towers has decided to work with Atomize to optimize prices for its 1200 first-class rooms and suites, with 41,000 m² of experience areas, five popular bars and restaurants. Atomize revenue management platform automatically optimizes room prices, down per room type, through state-of-the-art data driven machine learning algorithms. “We are very excited and proud to have Gothia Towers onboard Atomize. 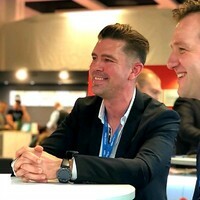 I believe this proves our ambition and demonstrates that Atomize has something really unique in its offering”, says Alexander Edström, CEO at Atomize. Gothia Towers is located in central Gothenburg, Sweden, just a couple of blocks from the restaurants and nightclubs on fashionable Avenyn. Close to the city centre, the location offers excellent transport links, right next to Scandinavia’s biggest amusement park Liseberg, Scandinavium and everything the entertainment district has to offer. “Our ambition is to provide the best solutions and offers to our customers and guests. Atomize has proven themselves to be able to output price recommendations that we highly trust. We are very impressed with what Atomize offers in terms of technical competence, agility, responsiveness and overall delivery and we are looking forward to work with them for the long term”, says Johan Forsberg, Director of Revenue Management. Gothia Towers is a member of Worldhotels, which consists of almost 450 hotels at more than 250 destinations around the world and is a part of the Swedish Exhibition & Congress Centre Group. 1.8 million visitors each year. 5 restaurants and bars. From fine dining to sandwiches to take away. 1,200 hotel rooms, including 11 luxury suites. 60 meeting rooms for 2 to 9,000 guests. Congress hall for 1,500 people. Parties and banquets catering for up to 7,000 people. More than 30 fairs and 8,000 exhibitors each year. Experience areas covering 41,000 m² that are also used for fairs and congresses. The Theatre – a show arena for the biggest shows and performances by major artists. Upper House, a five-star hotel with its own Michelin restaurant. Based in Gothenburg, Sweden - Atomize offers hoteliers the opportunity to increase their RevPAR by automatically setting the optimal price at any given moment, for every room and booking type. Atomize aims to build the most intuitive, yet most powerful and fully automated Revenue Management System for hotels. Since inception, 2017, Atomize is used across 18 countries and 6 continents. More information can be found at https://atomize.com.